Last night, I picked up my first of two fall CSA shares from Basket of Life Farm. I was thrilled to see some Rainbow Chard on top of the first box (that’s right – two boxes!) along with some beets and a kohlrabi. I have to do some research on the kohlrabi – I’ve never cooked with one or eaten one, so that should be an adventure! I also got shallots, onions, potatoes, a huge beautiful cabbage…and a fabulous selection of squashes. 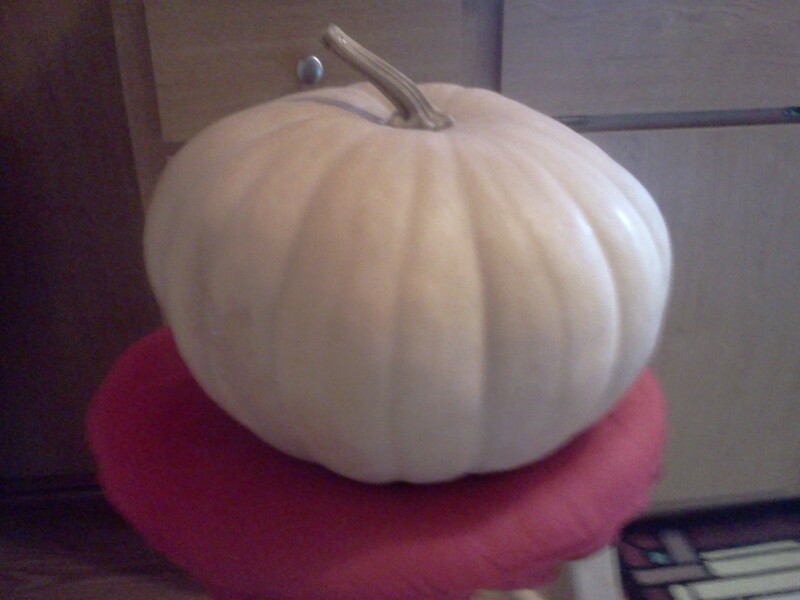 Two big butternut squashes, acorn squashes, kobacha squashes, a pie pumpkin and a buckskin pumpkin! Unfortunately, storage space is at a premium in my kitchen, so this morning I decided that I needed to cook up some of this squash to freeze for later. The buckskin pumpkin is the largest, but it’s also supposed to last for quite a while, so I moved on to my next target: one of the super sized butternut squashes. I cut the squash into quarters and scooped out the seeds. It was so big that I needed two casserole dishes to fit all the pieces! I roasted them at 400 degrees, skin side up, with a small amount of water in the casserole dishes. It took about an hour and a half until all the pieces were tender. I let them cool for just a few minutes, and scooped out all the good bright orange squashy goodness. 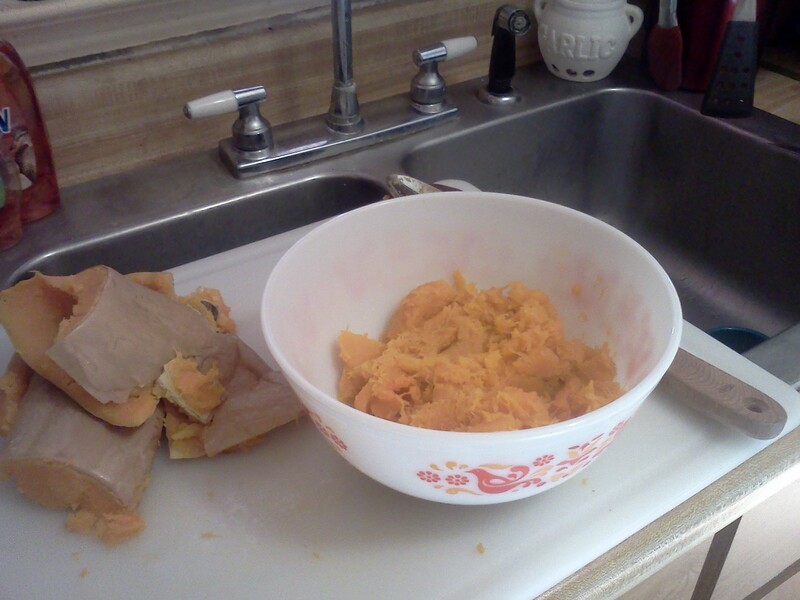 This was about a third of the cooked squash. It made a ton! Well, since I had this yummy looking cooked squash right in front of my, I decided to try a recipe that I had seen on one of my new favorite blogs – Five and Spice. It was a recipe for a Baked Winter Squash Pasta. I know – sounds great, right? As it turns out, this dish is awesome. I think I’m going to be making it again for a new Thanksgiving side dish! I also entered this recipe in my calorie tracker (that’s right, I’m still tracking!) and it’s only 110 calories per serving. 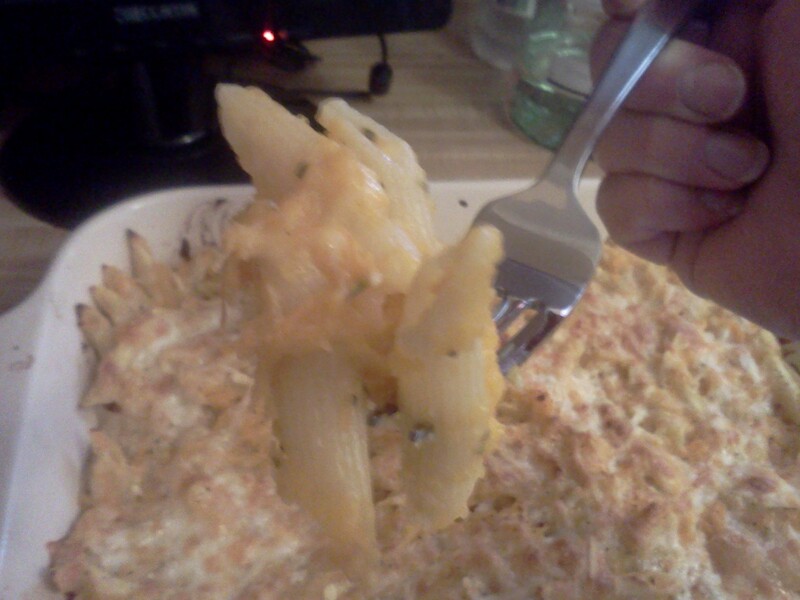 Now, I did use low fat sour cream, but I wasn’t skimpy on the cheese and this is still a really healthy recipe. I would definitely recommend it! It only took a few minutes to mix together the squash sauce and cook the pasta. I popped it back in the oven to get all melty and delicious, and broiled it at the very end to brown up the cheese on top. And even though it wasn’t quite lunchtime yet…I’ll admit it. I had to try a bite! Thank you to everyone out there posting great squash recipes – I’m going to need them! 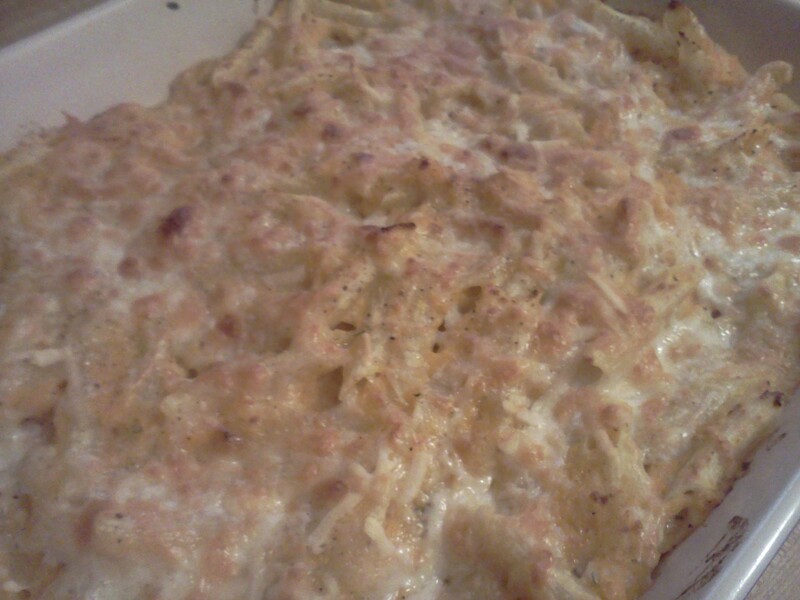 This entry was posted in CSA, Dinner, General, Recipe and tagged baked pasta, squash, winter squash on November 10, 2012 by Melissa. HI! In no particular order, I’m a cook, blogger, reader, crazy cat lady and lover of local foods. Sounds like a great recipe for Thanksgiving! And it’s vegetarian – perfect for you! It’s a little overwhelming, but at the same time, I’m enjoying the challenge! Squash meat freezes really well after you cook it also. Good to know! I’ll probably cook up another squash or two today to freeze. It will definitely be nice to have that beautiful orange squash in the middle of winter when Ohio is cold and grey!